In January 2015, the Minister of Development of North Eastern Region (MDONER) announced the launch of the “Make in Northeast” initiative, a regional policy inspired by the vast national industrial development program known as “Make in India” strongly desired by Prime Minister Narendra Modi. 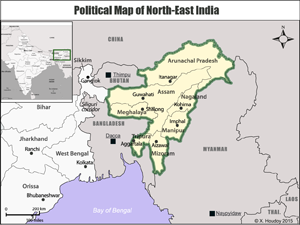 Territorially landlocked, permanently kept on the fringe of the Indian collective imaginary, North-East India is a land peninsula covering an area of nearly 255,000 square kilometres (7.7% of the Indian territory) bordering from West to East, Bhutan, China (Tibet), Myanmar and Bangladesh. Connected to the rest of India by the Siliguri corridor, a mere twenty-kilometre wide strip of land, the region suffers, at the national scale, of a growing socio-economical gap and qualifies as a periphery through both symbolic and political lenses. Over the last few years however, New Delhi has shown a growing interest in the development of the area, home to an estimated 40 million people (3.1% of the national population). The primary goal is to fight the isolation of the region by working towards its regional integration -in the official rhetoric, turning a "dead-end" into a "bridge" between South Asia and its eastern extended neighbourhood. This policy, originally outlined by the United Progressive Alliance (UPA) coalition which ruled the country from 2004 to 2014, has since then been adopted by the Bharatiya Janata Party (BJP), its rival now in power. Although shared beyond political divides, this approach raises certain interrogations as it validates the supremacy of the Central government over a region that appears as artificial under many aspects. In fact, the so-called “North-East” evokes neither any cultural reality nor any collective memory but rather embodies an homogenized and simplified vision promoted by New Delhi in its efforts to expand its reach over a largely ignored and marginalized territory. The land known today as the "North-East" became part of the British Empire in 1826 when the signing of the Yandaboo Treaty marked the end of the first Anglo-Burmese War. Aside from the Brahmaputra valley (presently located in the State of Assam), endowed with sizeable hydrocarbon resources and suitable for tea culture, the rest of the territory was considered by the British Raj as a buffer zone to contain expansive moves from the enemy - Burmese, Chinese and later French, Japanese. In those areas, the colonial ruler merely sought the allegiance of local population without establishing a proper administrative presence. While this state of ‘loose governance' continued for a few years after the Independence of India in 1947, the Partition that ensued aggravated the region's isolation and created the conditions for its economic marginalization by depriving it from its main maritime outlet, the harbour of Chittagong. In the 1950s-1960s, the country's integrity faced challenges by the emergence of internal threats - the Naga, Mizo, and Manipuri uprisings - and external threats - the border dispute with China which caused the 1962 war - that convinced New Delhi of the necessity to assert its sovereignty. As a result, the Constitution of 1950 granted exceptional tutelary powers to the Centre, hence creating a ‘flexible' federalism, commonly described as asymmetric. However, the increasing military presence and the intensification of the process of national integration kept increasing the growing distrust towards the federal government, damaging even more the native populations' already weak sense of national belonging. The first attempt to foster development implemented at the time was widely regarded as a tool to anchor the presence of the State in the region. This implantation was mostly driven by a security approach that the State used to legitimate an irregular deployment of democratic institutions, hence contributing to the marginalization of the NER. The security-driven angle ultimately failed to resolve the issues faced by the Indian nation-state, thus forcing New Delhi to reformulate its approach to the region at the turn of the 1990s. In order to foster development in the region, the UPA government decided to incorporate the NER into the Look East Policy (LEP), which since the early 1990s had been focusing on strengthening the economic ties between India and its neighbours to the East. Including the NER in the regional and trans-border initiatives already in place would on the one hand encourage the region's integration and on the other hand intensify India's external relations with its South-East and East-Asian partners. This policy contributed in bringing new actors to the forefront, thus breaking the monopoly that the Ministries of Home Affairs (MHA) and Defence (MOD), respectively in charge of the internal and external security of the region, had enjoyed hitherto. The 2000s saw the installation of India's main chambers of commerce and industry in the region, as well as the opening of a branch of the Ministry of External Affairs (MEA) in charge of coordinating the inclusion of the NER into the LEP. Although this undoubtedly reveals a renewed interest for the region, it also creates a paradox: by working towards its territorial opening, the region is getting institutionally land-locked, wedged between the pro-liberal logic promoted by the MEA and a security-driven prism kept alive - and at times exploited - by the traditional actors. The creation of the Ministry of Development of the North-East Region (MDONER) in 2004 was intended as a solution to this problem, as the newly established institution's mandate was to coordinate the roles of the various players involved in the region. However, the new Ministry - located in New Delhi and composed of officers who know very little about the matters at stake in the region - rapidly proved incompetent. 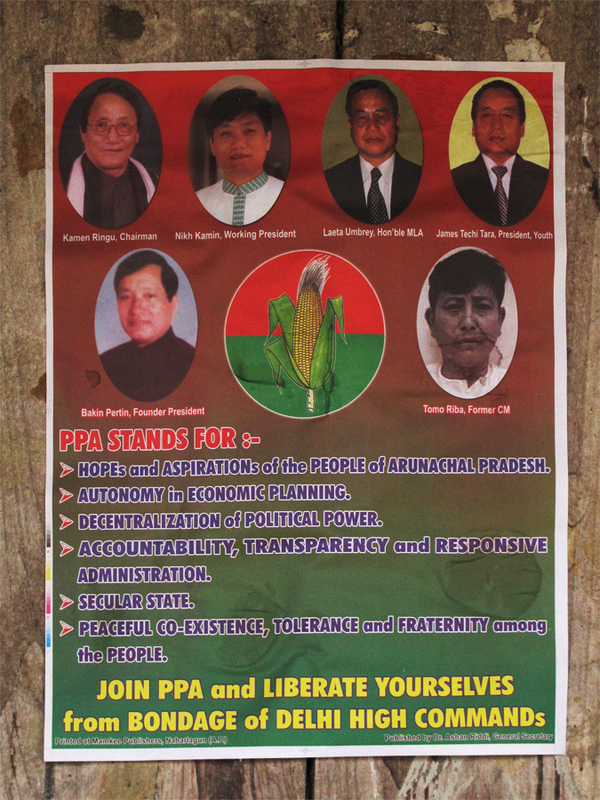 In fact, its legitimacy was fragile from the very outset since its objectives infringed on the prerogatives of the North Eastern Council (NEC), based in Shillong since 1971, which despite its lower institutional rank, had managed to conduct a constructive debate on the socio-economic dynamics of the region. Consequently, MDONER's “Make in Northeast” initiative, supposed to fight the region's economic marginalisation by the development of tourism and the promotion of a local industry in order to accelerate its regional integration thus appears as yet another attempt to promote a top-down approach to development, that doesn't include any consultation with local stakeholders. From the region's point of view, security and development policies have a substantial similarity-both are elaborated, funded and implemented by New Delhi and both - as a stick-and-carrot method - aim at strengthening the Central government's overwhelming power in the region. 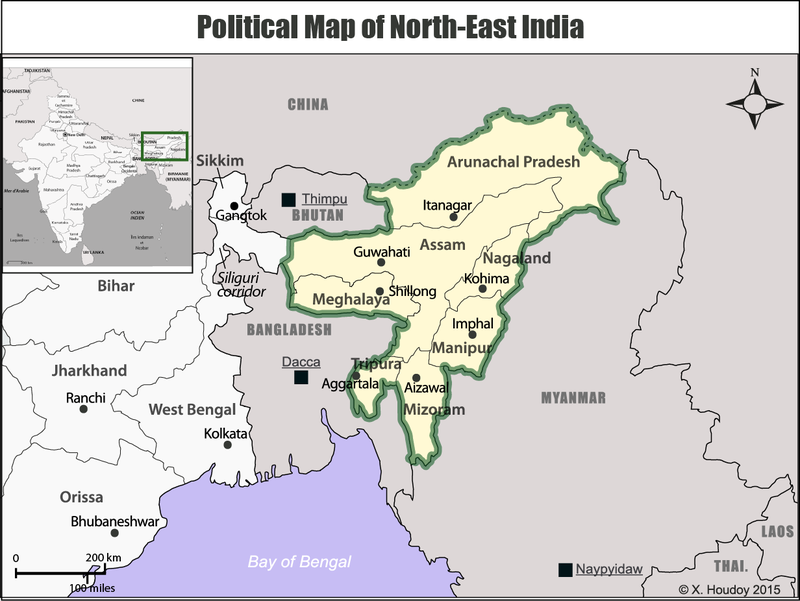 The tight grip India's Constitution grants to the Centre on the governance of North-East is extended by well-established networks fuelled by substantial financial flows from the Centre, subject to corruption and to endemic nepotism. 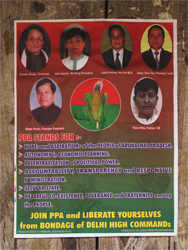 At a political level, a State's number of representatives at the Lok Sabha (the Chamber of Representatives) being proportional to its population, North-Eastern State governments have - except for Assam - a paltry political weight that does not allow them to gather attention at the national scale. Besides, political life in NER is, except in few cases - Tripura, Mizoram - dominated by national parties - Congress and BJP - which are the least inclined to question the guidelines issued by the Centre. Consequently, the political sphere is tightly controlled and any attempt to impulse a bottom-up dynamic is bound to face multiple fractures, be they geographic, social, cultural or institutional. As a result, when it comes to NER, transition through different administrative levels is a one-way process. In order to weigh more, the governments tend to unite under a common "North-East" banner, thus perpetrating the image of a monolithic and homogeneous unit, forged and promoted by the Centre. Flattening down the multiple particularities of the region exacerbates identity and socio-economic tensions and widens the gap between the population and its political representatives. Finally, no substantive debate has taken shape in India's political sphere over the governance of the NER, something that reveals the extent of the political, economic and cultural marginalization of the territory. Instead of emerging on the political stage, the question of the development of North-East is held by a few think-tanks and academic circles that stand for their independence and reliability and which have de facto positioned themselves as the only intermediaries. If they sometimes manage through their own channels and processes to overcome the multiple obstacles and reach the circles of power, their role remains far too marginal to effectively reverse the balance of power. PhD candidate at the French Institute of Geopolitics (Paris-VIII University). in North-East India as part of his PhD thesis. For this purpose, he conducted extensive fieldwork in the area in 2014 and 2015.